With this issue, Christos Gage begins his Captain Marvel run, with his wife Ruth Fletcher Gage co-writing. The comic opens up with Captain Marvel finishing repairs on the Alpha Flight station, using her energy powers as a welding tool for a nice touch. She flies back into the station and into a 6 month anniversary of her command. It’s a fun way to open a comic that gets serious and political fast. Each member of the classic Alpha Flight team gets a couple lines and character moments, and there’s also a romantic scene between Carol and War Machine. The political side of the comic ties close with Civil War, referencing Ulysses a lot while Carol tries to hide his name from an interplanetary panel with similar interests to the Alpha Flight Station. While short, this scene does a great job at highlighting some of the political challenges of such a panel, while Carol and Black Panther both intentionally conceal the true nature of the Inhumans’ new ability to predict the future. The action soon follows, with a Kree scientist/terrorist who’s planning biological experiments on humans that could prove deadly to many if she’s not stopped. The action scene again involves most of Alpha Flight and ends with a simple yet effective solution, while promising an intense story arc to come. The best part is, this story does a great job at reinforcing Carol’s point of view on Ulysses and how useful he can be, while still leaving room for potential consequences. The art by Kris Anka is great. Everything looks clean and smooth, yet there’s still some great detail when their needs to be. The opening page of Carol welding the space station with her powers is complete with sparks flying all over, and the glow illuminating her face while the back of her head is dark, thanks to space. The council chamber looks perfectly sci-fi, and there are a couple panels with detailed maps while Carol is searching for the Kree terrorist. The fight scene feels intense, and there’s plenty of debris when the Kree terrorist tears apart one of Alpha Flight’s space fighters. Matthew Wilson’s colouring is also great. Everything is bright, colourful and looks fantastic. This is a strong comic, and a fun start to Christos and Ruth Gage’s Captain Marvel run. It’s been a while since I’ve seen an ongoing Marvel series by the creator of Avengers Academy and it’s good to see he’s still great at balancing a large cast of characters while still focusing on the lead. Captain Marvel fans should be reading this series, and it’s worth checking out for those curious to give her a try. 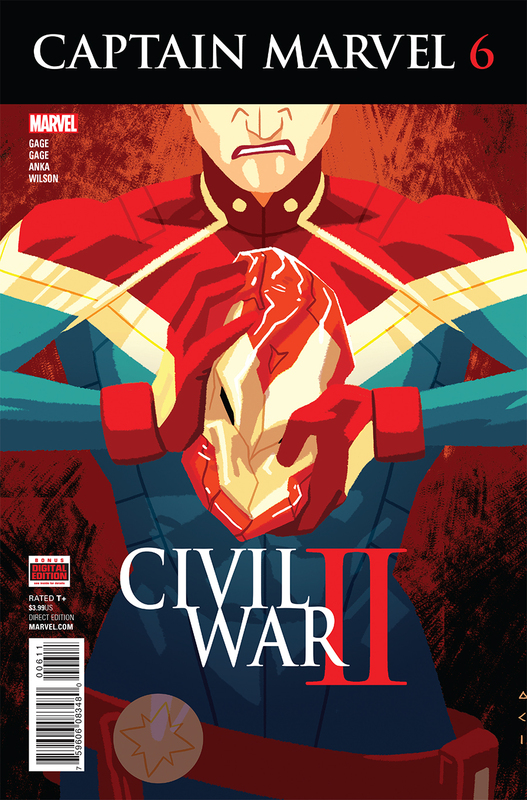 This entry was posted in comic, comic review and tagged all-new marvel, alpha flight, black panther, captain marvel, carol danvers, christos gage, civil war, civil war 11, comic review, comics, inhumans, james rhodes, kree, kris anka, marvel civil war, marvel comics, matthew wilson, ruth fletcher gage, ulysses, war machine. Bookmark the permalink. This was really good. I like the Board that Carol reports to. I hope we see more of them in the future. Especially Gyrich, who I always enjoy seeing show up. And Dr. Minerva’s a cool villain, and a great choice for a Captain Marvel foe.